Ever since Jim Ward went back into the hospital, I'd been thinking about some of the wonderful gaming products he has given our community. He's hanging in there and hopes to be back home soon. Of course his earliest game that I played, and one everyone will know since it has been revised and republished many times over the years, is Metamorphosis Alpha. It's probably the second RPG I tried after (O)D&D, though that might have been Boot Hill. 1974 was a long time ago, it seems. Either way, it and Gamma World that follow it were the go-to Sci-Fi RPG for me. I've played in a few Traveller campaigns and messed around with games like Space Opera and others over the years. However, earlier this year, I found myself playing Metamorphosis Alpha, this time with Jim Ward at the helm, twice. 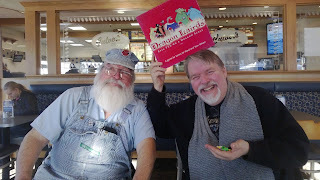 The first was at the tail end of Gary Con and I had another chance to play in an MA game with him at the Nexus Game Fair. Never got killed. Not once. Speaking of the Nexus Game Fair, I got a nice picture of Jim along with his colleagues Tim Kask and Frank Mentzer. I was lucky to be able to grab a seat in a game scheduled with each of them. Good fellas all and lots of great gaming has been had by me and many others because of their efforts. Keep an eye on the Eldritch Enterprises materials because these guys aren't done yet. A couple of years ago, I moved to Lake Geneva, WI, and since that time I have had quite a few chances to play with some long time gamers. Tom Wham regularly holds court at Taco Bell on Tuesday and Culver's on Friday for lunchtime and into the afternoon, and that means gaming. When his health and writing schedule has allowed for it, Jim Ward has joined in that fun as well. I've also had great fun playing the board game he designed alongside Tom Wham called Dragon Lairds (2007). It's a challenging card game that folks can grab at Lake Geneva Games and often at conventions like Gary Con, Nexus Game Fair, the Gaming Hoopla, and GameHole Con. Wisconsin almost has too much gaming fun!